Ellie Downie won European junior vault gold and all-around bronze in Bulgaria in May. Text reports and select video highlights of British success on the BBC Sport website and BBC News Channel. 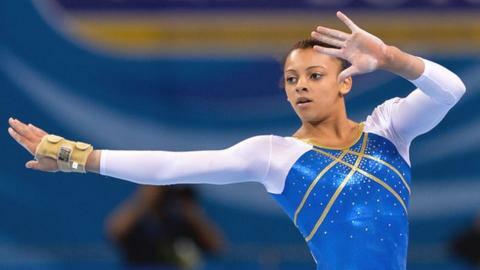 European junior gymnastics champion Ellie Downie headlines a 33-strong Team GB squad for the 2014 Youth Olympics. The Games in Nanjing, China, come four years after Britain claimed nine medals at the inaugural summer Youth Olympics in Singapore. The 2014 team, aged 15-18, will compete in 14 of the 28 scheduled sports. GB athletes will take inspiration from taekwondo fighter Jade Jones who won Youth gold in 2010 before her senior success at the London Olympics. 15-year-old Abigail Stones trains with Jones at the GB Taekwondo Academy in Manchester and as the reigning Junior World Champion will be expecting to challenge for honours in Nanjing. The will be no British competitors in the high-profile sports of track and field, cycling and tennis, but swimming is the best represented discipline for GB - with eight athletes. Annabel Dimmock and Robert MacIntyre will become the first golfers to represent Team GB at an Olympics since 1900. "Nanjing 2014 provides the perfect springboard for budding Olympians to gain valuable experience at a multi-sport event," said Team GB Chef de Mission Sarah Winckless. The former world champion rower added; "These events have helped shape the careers of Team GB Olympic stars such as Jade Jones and we hope the same will be said for Nanjing." Downie, 15, who's sister Rebecca competed at the 2008 Beijing Olympics, won junior vault gold and also became the first British woman to win a Euro all-around medal, in Bulgaria in May. She will be joined by fellow European junior gymnastics title winner Giarnni Regini-Moran, whilst London 2012 bronze medallist Beth Tweddle will help mentor the young athletes before the team depart. This is a great time to be a young British athlete! "It's going to be fantastic for these juniors to experience what it will be like if they make it to Rio and beyond," said GB gymnastics coach Claire Starkey. The British boxing squad are also targeting podium finishes with the aptly named Muhammad Ali (-52kg) and Peter McGrail (-56kg) winning silver and bronze respectively at last month's World Youth Championships. A number of sports which missed out on selection for the 2020 Tokyo Olympics will 'demonstrate' their potential for future inclusion at the Nanjing Games. Great Britain's Jen Wood will compete in sport climbing, whilst skateboarding, roller-skating, wushu will also feature. Archery - Bryony Pitman, Bradley Denny; Boxing - Muhammad Ali, Peter McGrail, Viddal Riley; Canoeing - Paul Sunderland, Victoria Murray; Equestrian - Jake Saywell; Golf - Annabel Dimmock, Robert MacIntyre; Gymnastics - Ellie Downie, Giarnni Regini-Moran; Trampoline - Zachary Sheridan, Zainub Akbar; Judo - Peter Miles, Lulu Piovesana; Modern Pentathlon - Henry Choong, Francesca Summers; Rowing - Chris Lawrie, Anna Thornton; Sailing - Hanna Brant; Swimming - Martyn Walton, Duncan Scott, Miles Munro, Luke Greenbank, Charlotte Atkinson, Amelia Maughan, Jessica Fullalove, Georgina Evans; Taekwondo - Abigail Stones, Christian McNeish; Triathlon - Ben Dijkstra, Sian Rainsley. Olympic skateboarding - could it work? Read more on Skateboarding: could it succeed as an Olympic sport?